John Bardis, the former MedAssets founder who as HHS assistant secretary of administration signed off on the charter flights of long-time friend HHS Secretary Tom Price, resigns effective April 6. He says he always intended to serve just one year. Bardis’s responsibilities include the HHS CIO office. Second in command in HHS to Bardis — and presumably the frontrunner to replace him in overseeing HHS HR, the CIO office, and Equal Opportunity compliance — is former technology executive and Trump campaign worker Jon Cordova, who just completed his two-week HHS suspension for his pre-election social media posts. From Cowtown: “Re: Microsoft’s March 15 copyright infringement lawsuit brought against Community Health Systems. Microsoft alleges that CHS stalled software audits for years and intentionally under-reported SQL Server usage by claiming only one-sixth of the production footprint. Maybe that’s not surprising when your CIO is Manish Shah, who was fired in 2002 from EMC for making his sales quota by falsifying invoices.” Shah joined CHS in 2013 after spending time at Aurora Health Care and no time in prison since he was never charged with a crime as far as I can tell and thus has never admitted guilt. I don’t have access to the filings to see what Microsoft is claiming. From Clara Barton: “Re: the attached news item. This, apparently, is still a thing.” Indeed it is. An RN who presumably forgot to lock her car the night before wakes up to find her nursing license, laptop, and thumb drive with PHI on it missing. That the ED person who reassured me that the hospital has only private rooms was either misinformed or lying since I was placed in a room with a guy who sounded like he was on death’s door. That I would lie for hours in the ED waiting for a bed, only to find when I got there that I had just missed dinner and nothing would be available to eat until breakfast. This was after being told that I missed lunch in the ED, being offered only apple juice instead. That I would be awakened all night by loud employees in the hall and by frequent vital sign and IV checks. That every med I received was late and some were never administered at all, including one that the ED insisted afterward was important. 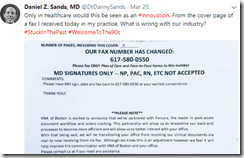 That the hospital would steadfastly refuse to give me an electronic copy of my information after my visit — they said they weren’t required to and would only give electronic information to doctors, not patients — and that my OCR complaint would be dismissed with no action taken against the hospital. Welcome to new HIStalk Gold Sponsor OmniSys. The Dallas-based company offers innovative solutions for retail, outpatient hospital, and independent pharmacies. 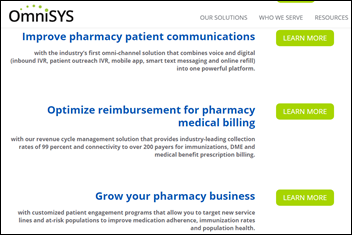 Products include an omni-channel patient communications platform; revenue cycle management for immunizations, DME, and prescriptions; patient engagement programs; and consumer engagement analytics. The company also provides domain expertise, market insight gained from serving 25,000 pharmacies, and proprietary SaaS technology that integrates with customer workflow. The company’s rules-driven OmniLink engagement platform improves vaccination rates, therapy adherence, and post-encounter follow-up, while its Fusion-Rx provides all-channel refill and pick-up reminders, manages refill requests, and offers an inbound IVR with automated attendant and voicemail. CEO John King is an industry long-timer going back nearly 30 years, starting with Shared Medical Systems. Thanks to OmniSys for supporting HIStalk. This seems to hit a lot of timely trends. 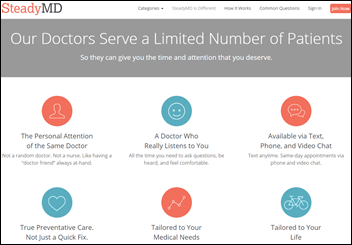 SteadyMD raises $2.5 million for its online, concierge primary care practice. It runs eight practices, most of which are specialized (bodybuilding, LGBTQ, triathlon, etc. ), but one of the practices addresses general health. SteadyMD patients meet their new PCP in a one-hour video visit, after which the company collects and stores all their medical records and makes the doctor available at any time via text messaging, phone calls, or video appointments. Membership costs $79 per month. The company says its doctors can prescribe, but doesn’t provide details of how that works. Washington Regional Medical Center (AR) selects Streamline Health’s cloud-based, automated pre-bill coding analysis technology. The Wyoming Department of Health chooses Medicity to power a statewide HIE that it hopes to eventually connect to that of neighboring states of Colorado and South Dakota, which also use Medicity. Glytec names Ed Furlong (Kyruus) COO. Robert Redfield, MD will become director of the CDC. A 20-year veteran of the US Army Medical Corps, Redfield has spent the majority of his career on HIV/AIDS research and clinical care. 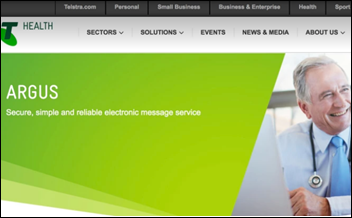 The 40,000 users in Australia of Telstra’s Argus healthcare secure messaging software are notified that their systems are vulnerable to outside attacks since the company always creates the same user account for remote access and then stores its static password in an unsecured text file. Telstra says hackers used the information to penetrate servers via Microsoft’s remote desktop protocol with full administrative access. 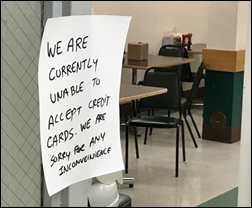 One person who examined a breached server said it appears that medical information wasn’t stolen, with the hacker’s main interesting appearing to be using the servers to host dating scams and to buy items with stolen credit cards. I suppose Telstra is correct in calling its service “secure” even if its installation of it isn’t. The threat of a negative patient Yelp review seems to hold more sway with physicians than educational campaigns encouraging them to reduce unnecessary prescribing of antibiotics. Physicians Working Together has launched a petition asking Yelp to remove negative doctor reviews. 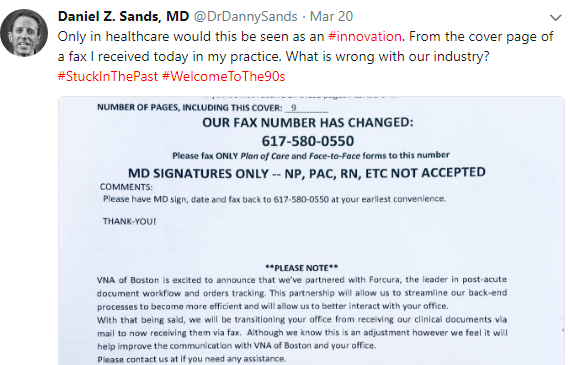 Danny Sands, MD, MPH assures his Twitter followers that the above fax from VNA of Boston to his practice announcing its transition from mail to fax is not an early April Fools’ Day joke. 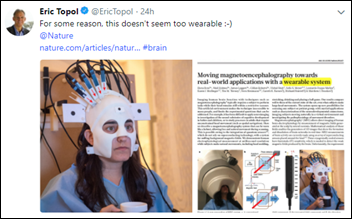 This contraption looks downright frightening, perhaps something that Michael Myers might have created for his Halloween activities as a Shatner mask replacement. I’m willing to bet the mug that the patient is so tightly clasping is filled with either calming tea or spirits. A survey that asked consumers to name a famous female technology leader resulted in 92 percent drawing a blank and half the remainder naming Siri or Alexa, fueling the fire under the question of why virtual assistant voices are always female. MedData will host a job fair March 24 at its office in Grand Rapids, MI. Meditech AVP Cathy Turner, RN joins the HIMSS CNO-CNIO Vendor Roundtable as co-chair. EClinicalWorks publishes a new customer success story, “World-Class Care in a Small Town,” featuring Pecos Valley Medical Center. Experian Health will exhibit at the MultiState Managed Care Meeting March 28-30 in Atlanta. PerfectServe’s Michelle McCleerey presents at the Population Health Colloquium.